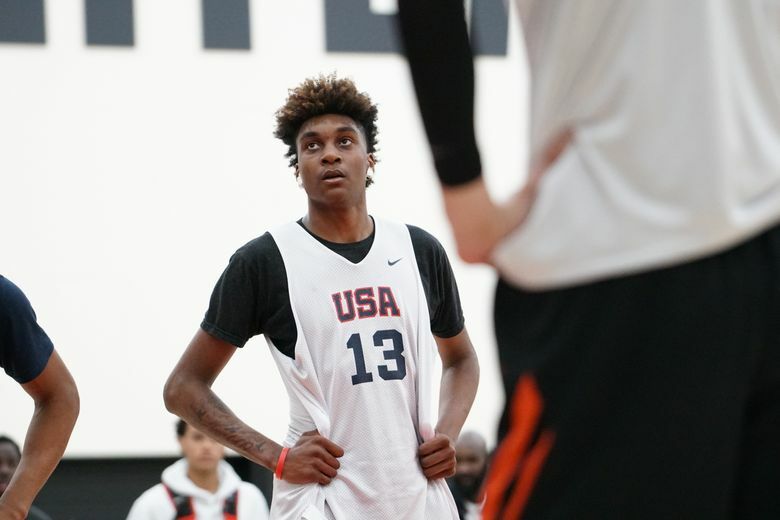 TUALATIN, Ore. — Aside from an occasional inquiry, Isaiah Stewart and Marcus Tsohonis have stopped recruiting Jaden McDaniels on behalf of the Huskies. Tsohonis, who signed with the Huskies last fall and played with McDaniels on the Seattle Rotary AAU team, will playfully ask him to throw up a “W” sign while posing for pictures. “That’s my guy,” said Tsohonis, a 6-foot-5 combo guard who played at Jefferson High in Portland. “We talk a lot, but it’s more like a friendship and it’s not necessarily about basketball. McDaniels isn’t bothered by the playful ribbing and understands it comes with the territory. With less than a week remaining before the start of the spring signing period (April 17 to May 15), McDaniels isn’t in a hurry to conclude a recruitment that has left spectators guessing. The highly touted 6-11 phenom who is projected as the No. 1 overall pick in the 2020 NBA draft, took official visits last fall to all five of his finalists — Washington, San Diego State, Kentucky, UCLA and Texas. McDaniels’ recruitment has been described as mysterious because he’d rather talk about anything other than his college choice. Adding to the ambiguity is the dearth of information coming from his tight-knit circle of advisers that includes his parents and brother Jalen, who played at San Diego State. “I’m my own person,” said McDaniels, who is one of just seven among the top 50 prospects, according to ESPN, that remains undecided on their college future. “I think differently. People usually commit early and don’t usually wait as long as I am. Last week UCLA hired Mick Cronin, a move McDaniels said didn’t “help or hurt” the Bruins’ chances to land his services. McDaniels offered no clues as to when he’ll make announce his decision. He’s more focused on improving his game while playing in the Jordan Brand Classic, the Iverson Classic and the BallisLife All-American Game. On Thursday, Tsohonis shared the court at the Portland Trail Blazers practice facility with McDaniels. Tsohonis and McDaniels played on a team comprised of Pacific Northwest standouts that scrimmaged against Stewart and Team USA ahead of the Nike Hoop Summit. McDaniels, who averaged 23.2 points, 10.3 rebounds, 3.2 assists and 2.1 steals last season at Federal Way, displayed the versatile skill set that’s drawn favorable comparisons to Kevin Durant. During one sequence, McDaniels squared off against Stewart on the perimeter and rose over the 6-9, 248-pound forward for a 20-foot jumper.